If you love seafood, I promise you'll love this! Sometimes I'm a little skeptical about writing recipes that are considered delicacies, that others may considered a huge turn off. But I figure there are plenty of foods that some may think look awful, which could be completely normal to others! I grew up eating all kinds of different foods that others may think are crazy... As long as it tastes good, I'm ready to try! Bizarre Foods anyone? lol. Anyways, I thought this turned out great, so for anyone looking to try something a little different, this is super easy to make. Place raw octopus in a stock pot, and fill with water to cover. Sprinkle a bit of salt to flavor the broth. Bring to a rolling boil. Once the meat is tender enough to pierce with a fork, remove from heat (Save the delicious stock for later use by freezing.). 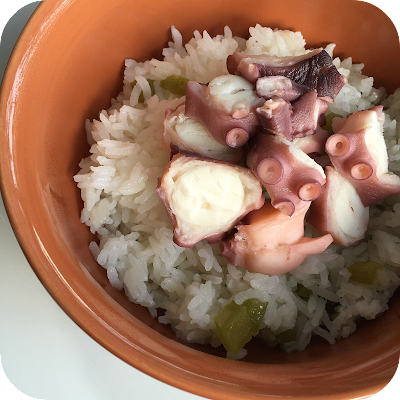 While the Octopus is cooking, cook 2 cups of rice, butter, and diced green bell pepper in a rice cooker, according to your rice cooker's instructions. Serve sliced octopus over a bed of rice, and drizzle Ponzu Sauce on top. Enjoy! What's the most unique food you've ever tried?